pre-manufactured cabinets from a home center or design center. and a lot of communication between all the parties involved, we can accomplish this goal. Our first step together is gathering enough information from you, to be able to provide you with an accurate estimated project cost. Having this step at our show room is helpful to both parties involved. So that you will be able to choose a door style, wood specie and finish for each room of cabinetry. It may be helpful for you to bring with you floor covering samples, back splash samples, counter-top samples, paint color chips, etc. If you have not yet picked out some or all of these other items, that is fine; many people prefer to start with the cabinetry and pick all of these other items based on the cabinetry selections. During this meeting we will discuss your ideas of what you would like your cabinetry to look like and what features you would like to incorporate into the cabinetry. Typically we start with a set of architectural blueprints, so we will need you to bring a copy with you that you can leave with us. Ideally these plans will not have been reduced in any way, as that may distort the scale. 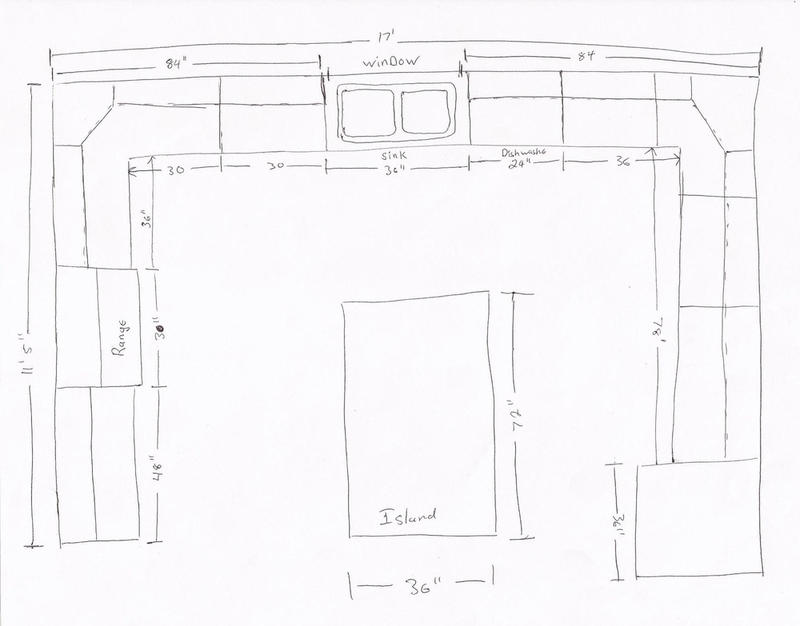 If you are not working with an architect, or you do not have blueprints, or your project does not require blueprints, we simply ask that you provide us with a simple sketch like the one shown here. This sketch does not have to be perfect, so please don't be intimidated by it. We simply need enough information to determine the overall floor plan of the area and the location of any fixed objects like doors, windows, etc. Our primary objective in this meeting is to develop a good understanding of your design ideas and to answer any questions you might have concerning those ideas. It would also be very useful if there are budgetary requirements or constraints that you let us know those at this point in the process. There is no practical benefit in us designing a $30,000.00 kitchen for your project if your kitchen budget is $18,000.00. Once an estimated cabinetry budget has been established, we will assist you with your material and door style selections to fit within the budgetary constraints. At Sylvester Cabinetry we provide free estimates. These estimates are very detailed and will provide you with the information you need to make a fully educated decision about your custom cabinetry requirements. We are more than happy to provide several alternate pricing scenarios, so please do not hesitate to ask. If you think you might want to upgrade to an applied mold door, upgrade the drawer box, change from slab to raised panel ends, or any other change, addition or subtraction, we will be more than happy to accommodate those change requests (this is the time to do so, not after the manufacturing process has been put into motion). Typically our estimates are sent to you via e-mail as a PDF attachment, but we can fax or mail your estimate if needed. If you prefer face to face meetings, then we will be glad to schedule a meeting in our showroom to go over your estimate, and even run a few "what if" scenarios while you are here if that would be beneficial to you. Our sophisticated estimating software makes if very easy to change wood species, finishes or door styles, and get an alternate project cost. As soon as we have received your signed estimate and your check for the design fee, we will schedule a time to come and field measure your project. During the time we are field measuring your project, we will typically identify any conflicts with any plumbing, electrical or HVAC items and inform the appropriate person (the home owner, site supervisor, project manager, builder, etc). We will then produce a design using our advanced design software that will allow you to see in high quality three-dimensional renderings of what your cabinetry will look like before we ever manufacture it. The next step will be for us to schedule a design review meeting at our showroom. At this time we will present you with our drawings and review them wall by wall and room by room. We will red line the drawings with any additions, changes, or subtractions and note any discrepancies that are discovered. If there are no discrepancies, additions, changes or subtractions, or once they have been dealt with, we will then proceed to produce a detailed proposal for your project. As with the estimate, this proposal can be emailed, faxed or mailed to you, or we can meet at our showroom to review it in detail depending on your preferences. Once we have all these items in our possession, we will then review our current manufacturing lead-time (it ranges from 4 to 12 weeks depending on the number and size of the current projects in progress), which will determine the actual delivery date for each phase of your project. We will then notify the appropriate people of our proposed dates for delivery and installation. We will coordinate the delivery and installation with the appropriate site supervisor, the builder or you the homeowner. We will attempt to open a line of communication between Sylvester Cabinetry and the site supervisor so they can notify us of any delays that may affect the delivery and installation schedule. We will also provide the site supervisor with mechanical drawings of all cabinetry involved in the project to be used to answer any questions by any of the other trades on the project. At this point of the project we will visit the job site a second time to double check our drawings against the actual field conditions. Typically if there are any errors on our part, or any other trade's part, we will discover it while double checking all of the dimensions in each and every room. If there are any errors or discrepancies, we will notify the appropriate person immediately. The next step for us is to engineer your project, which simply means that we will review every detail of the design and check for any potential issues that may arise from the design. This is a painstaking and tedious process, but it is one of the most important aspects of providing custom cabinetry. Each and every project is unique, and we are not installing stock cabinets in 3" increments that will allow the cabinet supplier to substitute a different sized cabinet if one does not fit properly. We have to get it right the first time. we are constantly looking for ways to remove waste from our manufacturing process. We are constantly evaluating ways to eliminate any unnecessary handling of parts from our processes, always looking at how we do what we do and trying to find better ways to do it. We are resolute in our conviction that we need to remove the opportunity for mistake from each of our processes, and to set the next person up for success. Once all of your cabinetry, or the first phase of your cabinetry, is completed, we will contact you to schedule the delivery. This is when your vision or dream starts to become a reality. The installation process can take anywhere from a few hours to multiple days depending on the quantity of cabinets involved and the complexity of the project. This portion of the project requires extreme accuracy and highly skilled technicians to do it well. Our installers are some of the best in the industry and have the very best tools and equipment available. Our installation technicians install your cabinetry with the same skill and care that we created your cabinetry with. Sylvester Cabinetry utilizes the latest technology when it comes to functional hardware to assure you of the very best fit and finish available, providing a level of accuracy that is second to none. We sincerely thank you for taking the time to review our process. I hope that this 5-step process has been explained in a clear and thorough manner, but if not then please do not hesitate to call or email us with any questions or concerns you might have.